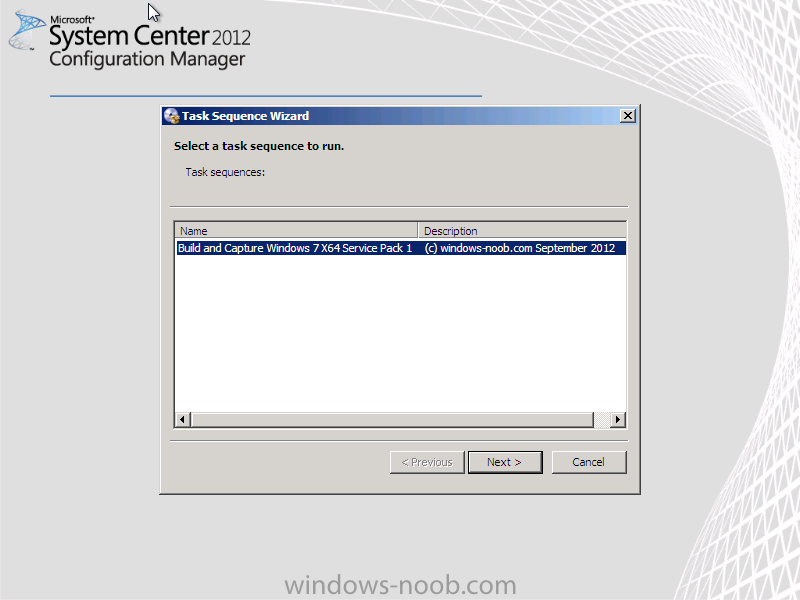 In Part 1 of this series we created our new LAB, we got the System Center 2012 Configuration Manager ISO and extracted it, then copied it to our Active Directory server. 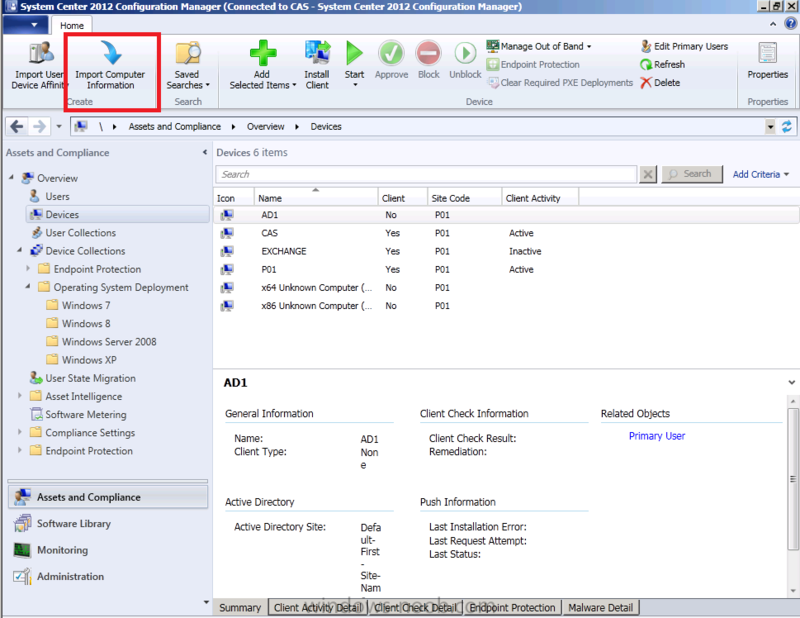 We then created the System Management container in AD, delegated permissions to the container, extended the Schema for Configuration Manager. 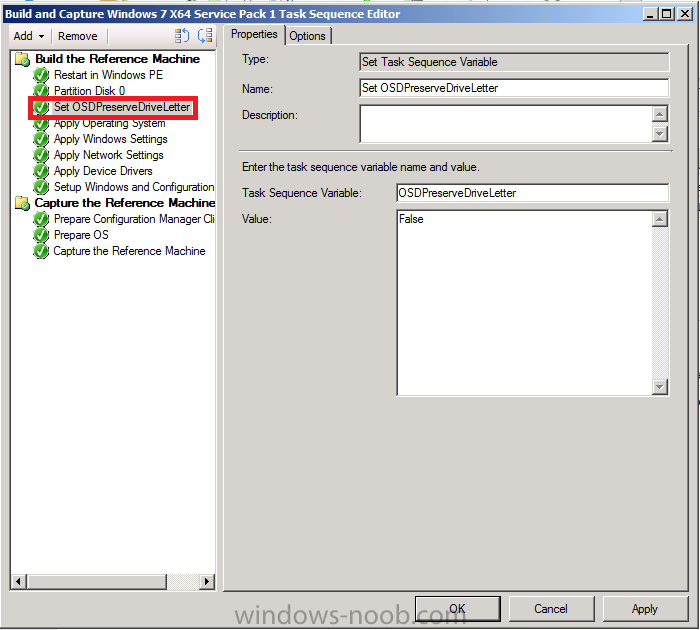 We then opened TCP ports 1433 and 4022 for SQL replication between sites, installed some prerequisites like .NET Framework 4.0, added some features and then downloaded and installed SQL Server 2008 R2 SP1 CU6. 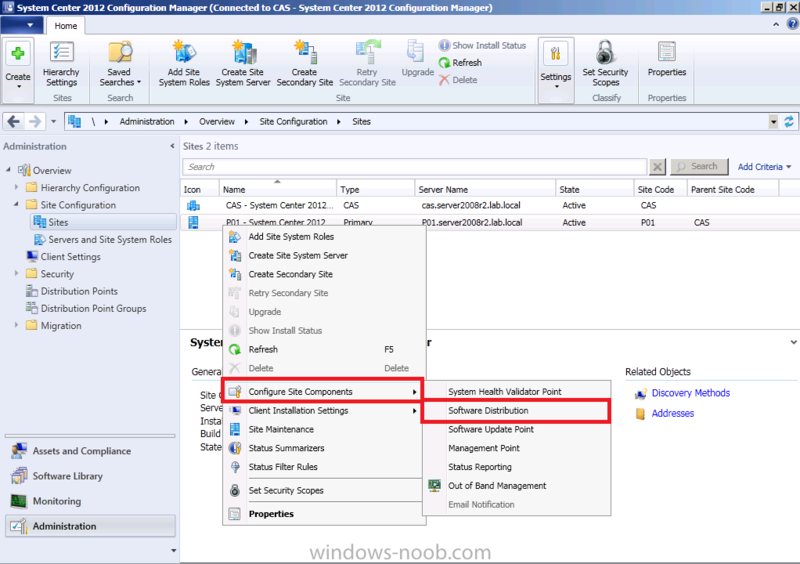 We then configured SQL Server using SQL Server Management Studio for security and memory configurations prior to running the Configuration Manager 2012 setup to assess server readiness. 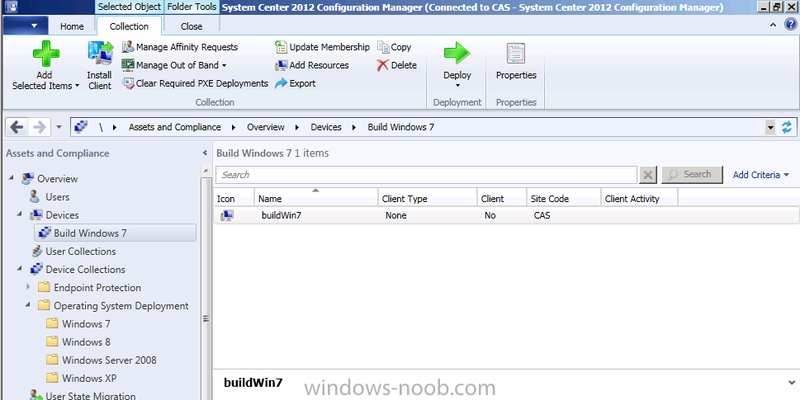 Finally we installed a central administration site (CAS). In Part 2 we setup our Primary server with SQL Server 2008 R2 SP1 CU6. 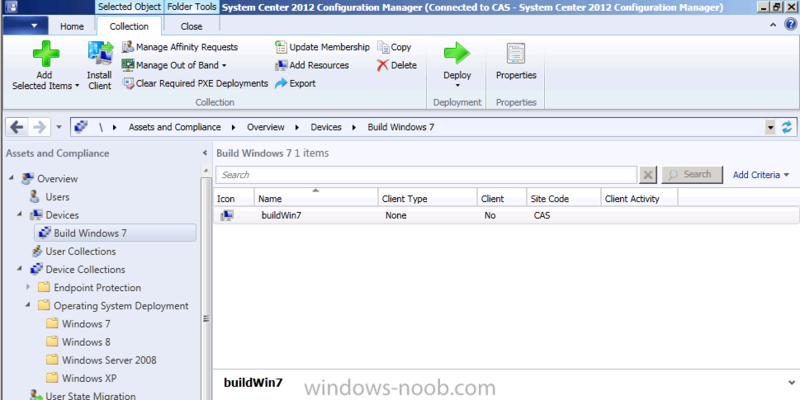 We then installed Configuration Manager 2012 on our primary server (P01) and verified that it was replicating to our central administration site (CAS) server. Then we configured Discovery methods for our Hierarchy and then configure Boundaries and Boundary Groups. In Part 3 we configured Discovery methods and configured boundaries and created a boundary group, we then configured them for Automatic Site Assignment and Content Location. In Part 4 we added the Application Catalog roles to our Hierarchy. 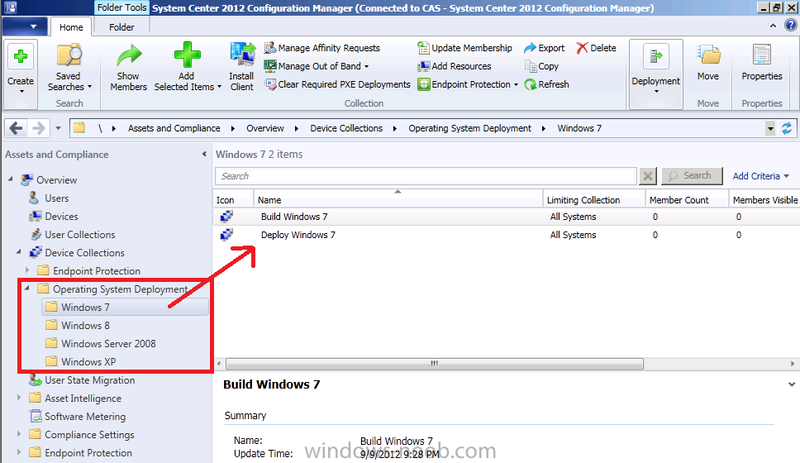 We then configured Custom Client Device Settings and then deployed those settings to the All Systems collection on site P01. 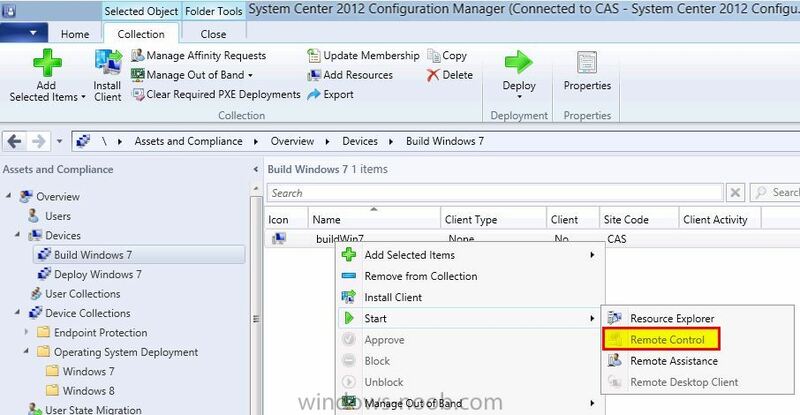 After that we created Custom Client User Settings and deployed them to the All Users collection in order to allow users to define their own User and Device affinity settings. 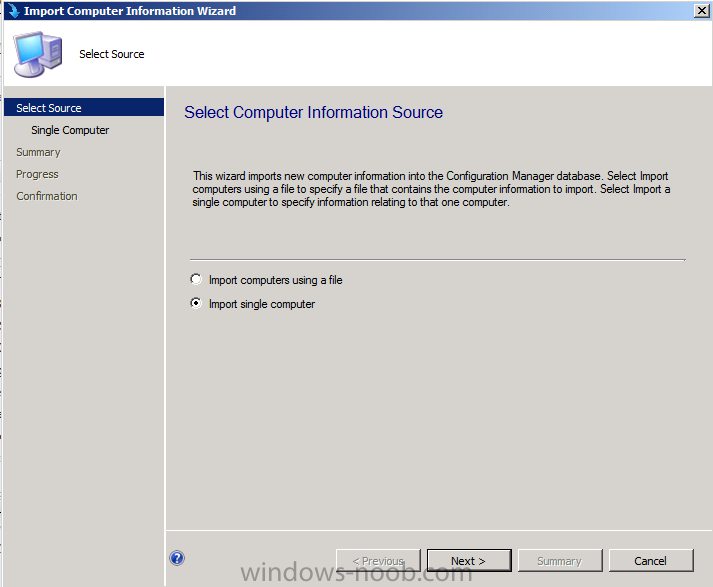 In Part 5 we installed the WSUS server role (it is required for the Software Update Point role). 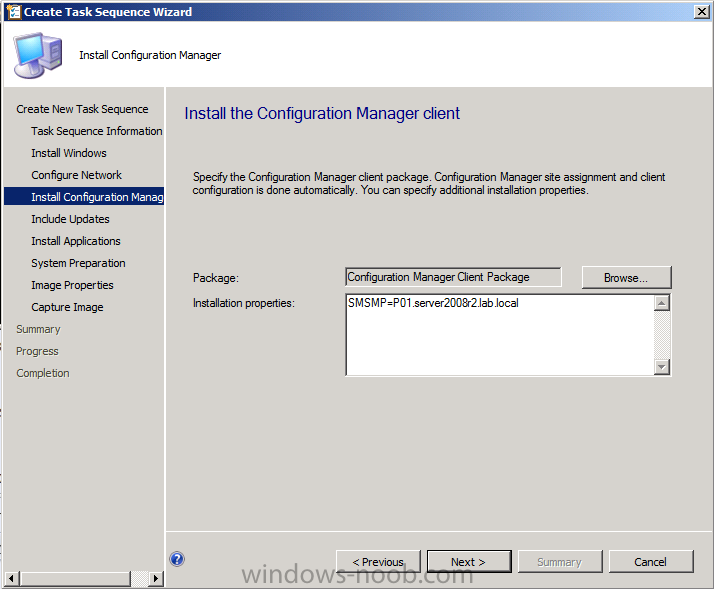 We then installed the Software Update Point role on our CAS and Primary servers and we configured the SUP to support ConfigMgr Client Agent deployment which is a recommended Best Practice method of deploying the Configuration Manager Client Agent. 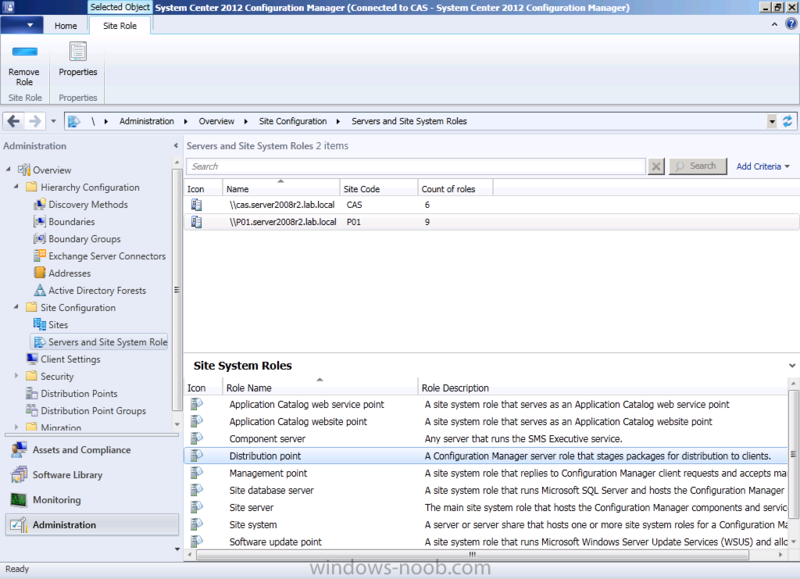 In Part 6 we prepared our server for the Endpoint Protection Point role, and installed that role before configuring custom client device settings and custom antimalware policies. We then deployed those custom client device settings and custom antimalware policies to our newly created Endpoint Protection collections. 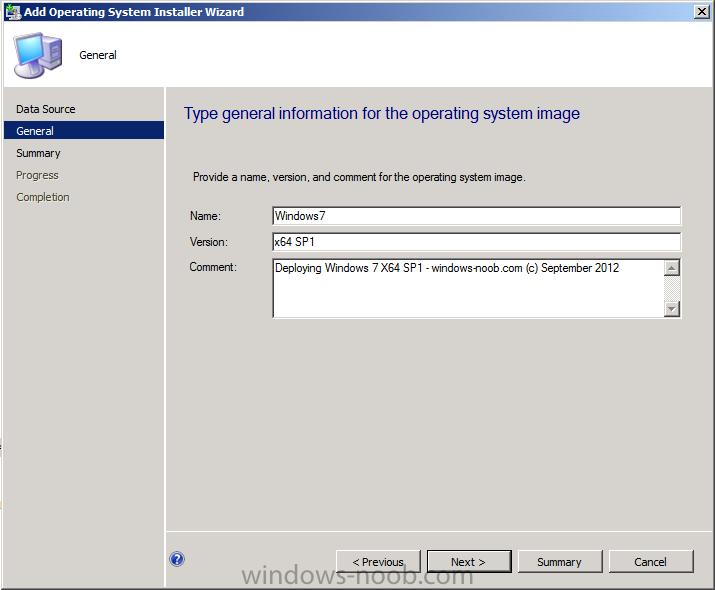 Now we will add operating system deployment ability to our hierarchy, starting by adding Windows 7 X64. We will use the Build and Capture process to capture a WIM image which we can later deploy to targetted computers using network boot (PXE). PXE boot requires specific settings on our distribution points and the boot images used to deliver the operating system WIM images must also be enabled for PXE support. 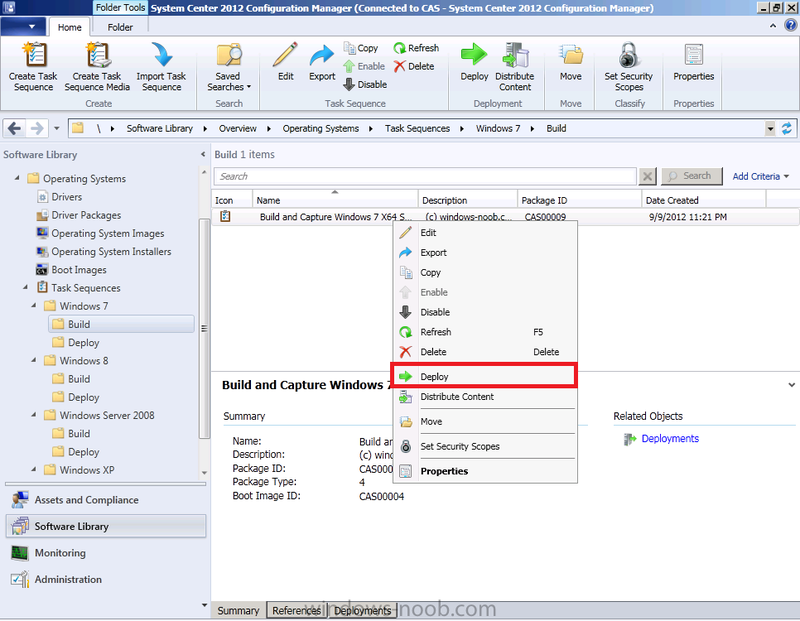 To get an overview of the Operating System Deployment process please review the following on Technet, and to see what's new is Operating System Deployment in Configuration Manager please see the following from Technet. 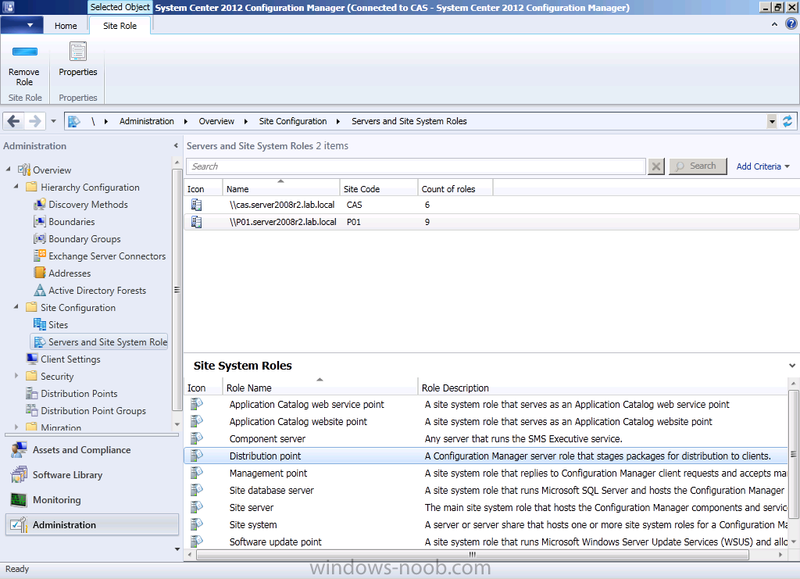 In the ConfigMgr console, click on Administration, Site Configuration, Servers and Site System Roles, select our Primary Server (P01) as it is the site server hosting our distribution point role. double click on the Distribution Point role listed, select the PXE tab and place a checkmark in Enable PXE support for Clients, answer Yes when prompted about firewall ports (UDP ports 67, 68, 69 and 4011 ). These options allow this distribution point to respond to incoming PXE requests and allow unknown computers to be supported, this is important as it allows you to do bare-metal deployments on unknown computers. 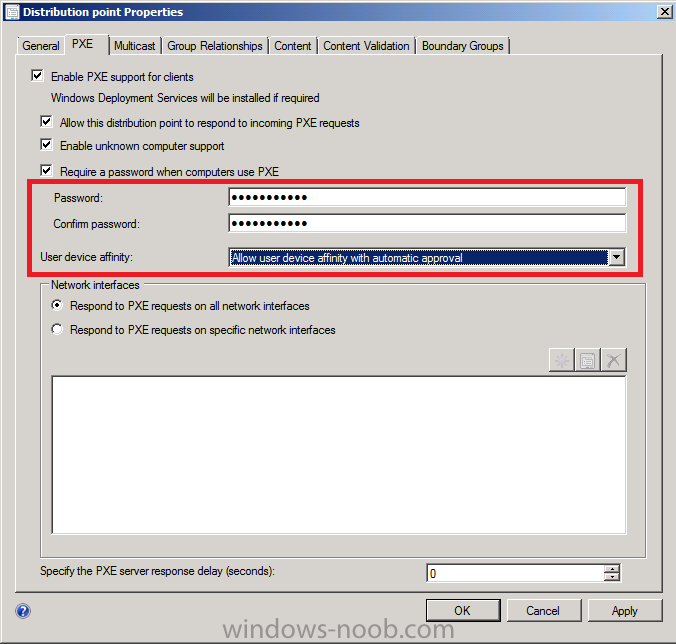 That said, you should always think about the what-if scenarios, what-if someone PXE boots their computer by accident and sees the F12 menu, do you want them to automatically gain access to any deployed task sequences or protect yourself from possible damage, if in doubt, enable the password option for added security. 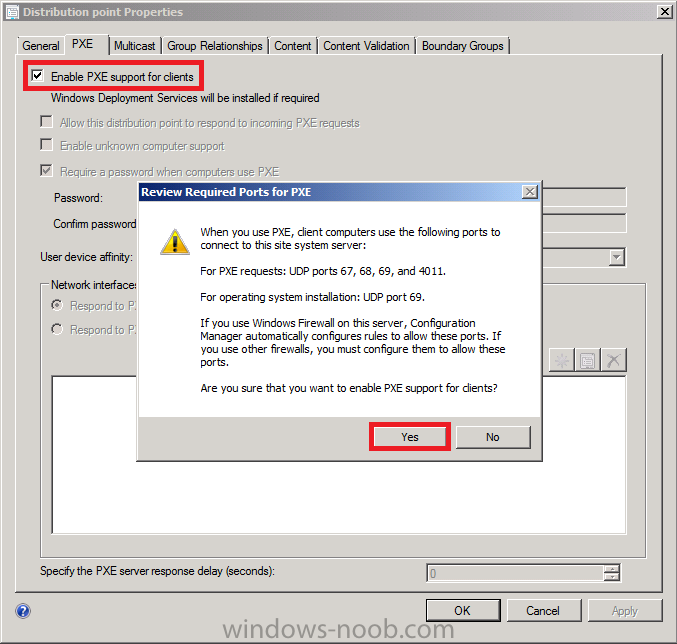 When you choose to enable unknown computer support, you'll get a warning popup about required task sequences, take note of the warning and add a PXE password. 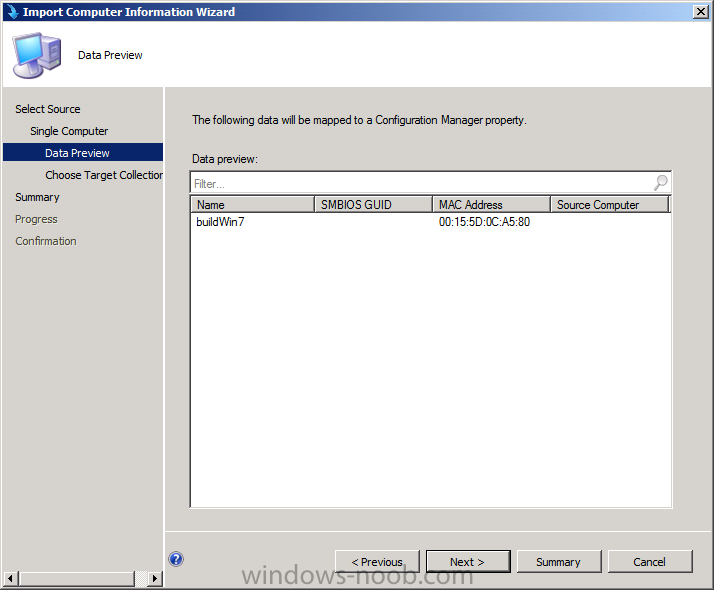 Adding the PXE password does not prevent systems from being imaged but it does provide one additional layer of protection to stop systems getting imaged by unauthorised users. In addition, if you plan on using User Device Affinity select your UDA settings from the drop down menu. Note: If you want to do Zero Touch deployments then having a PXE password will involve someone having to be present at the computer in order to enter the password (in other words it won't be zero touch anymore...). Having this PXE password prompt is for your security, you do not want to be the one who has to explain to your CTO that all your servers have been imaged with Windows 7. By clicking on Apply you will add PXE support to the distribution point on the Primary server P01. 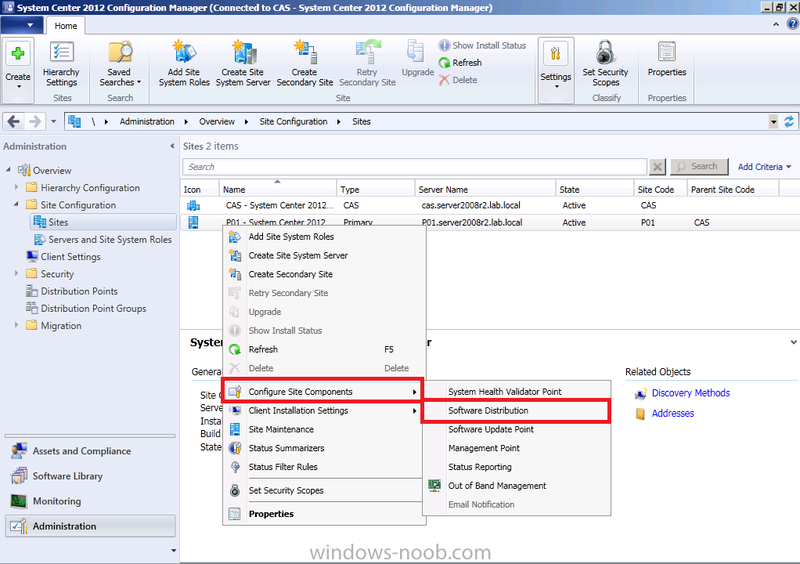 If windows deployment services are not installed on the primary server then that service will be automatically added to that server as part of this configuration. 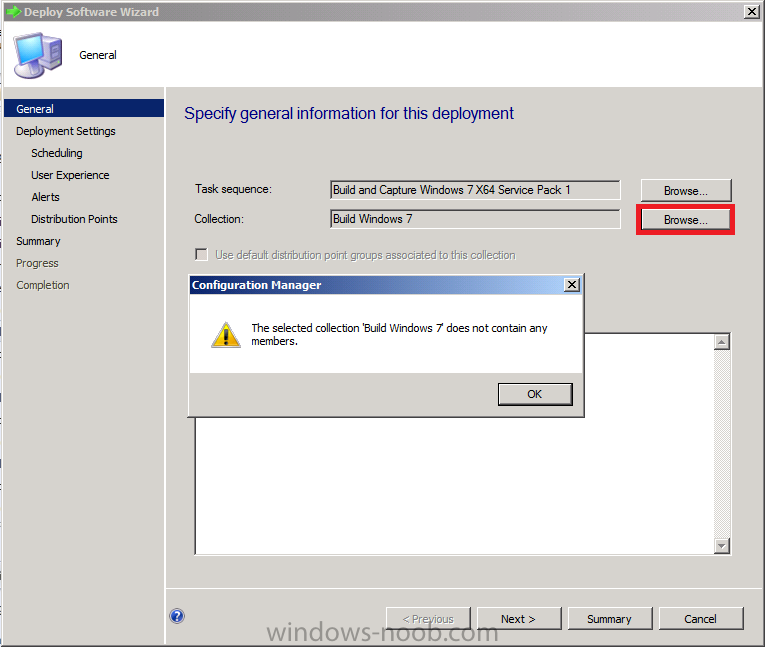 If you have a primary server with multiple partitions and want the windows deployment services RemoteInstall folder to be on a specific drive then you'll need to manually install it prior to enabling this option. 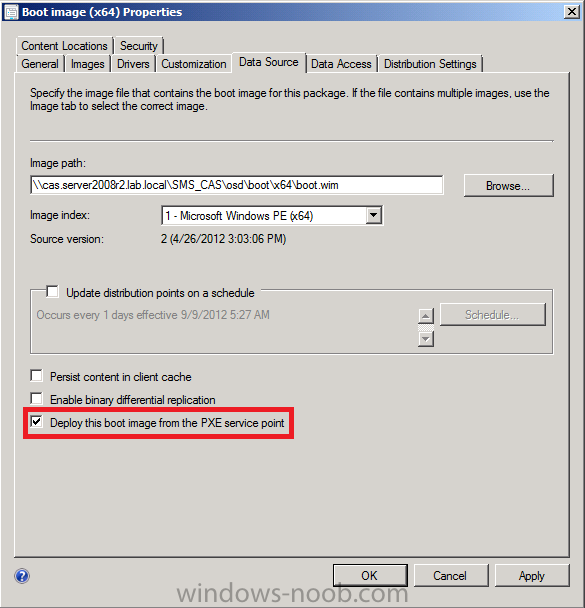 Tip: Monitor distrmgr.log on the P01 server to review installation of windows deployment services to support PXE boot on the distribution point on P01. See the screenshot below. PXE support requires boot images on our distribution points, therefore we need both of our boot images distributed to the distribution points. 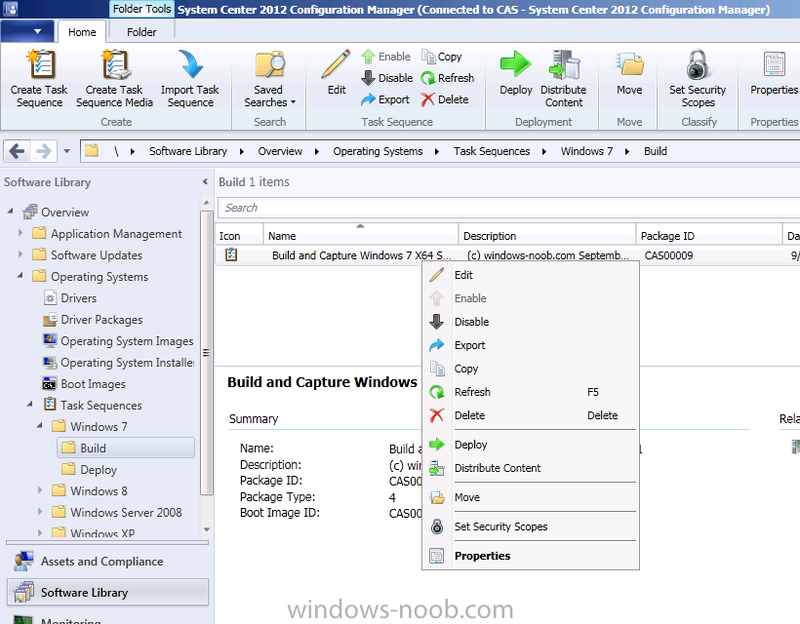 On the CAS browse to the Software Library workspace, expand Operating System Deployment and locate the boot images. Right click on the X64 boot image and select Distribute Content. 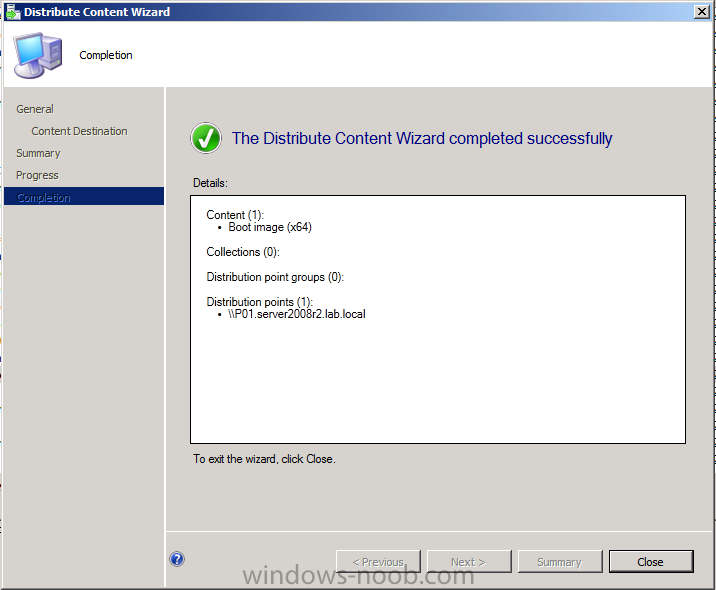 continue through the Distribute Content wizard to completion. 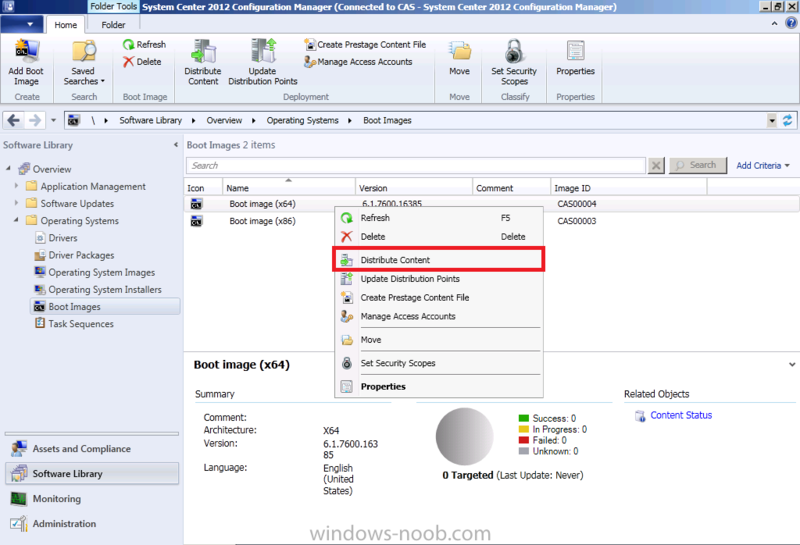 You can review the distrmgr.log file on CAS to see where it mentions that it is sending the boot image to our Primary server. 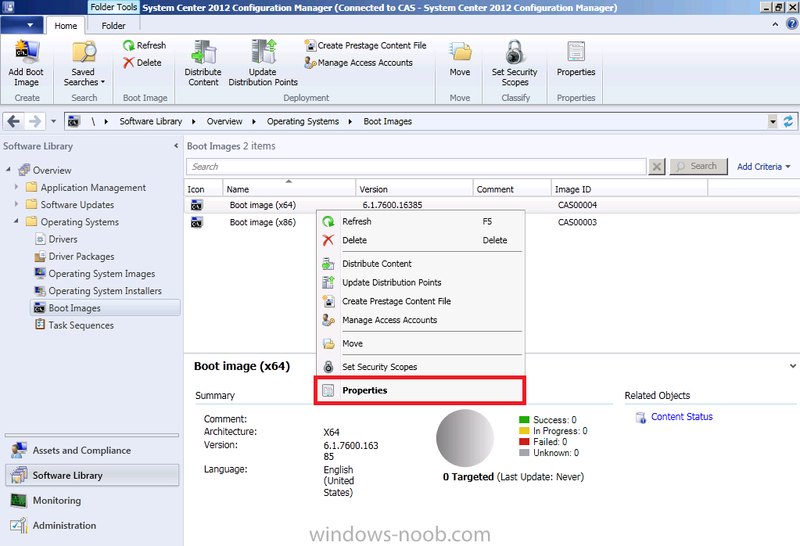 Note: Don't forget to repeat the above process for both the 32 bit and 64 bit boot images, we need both Architecture boot images (x86 and x64) distributed to our distribution points. 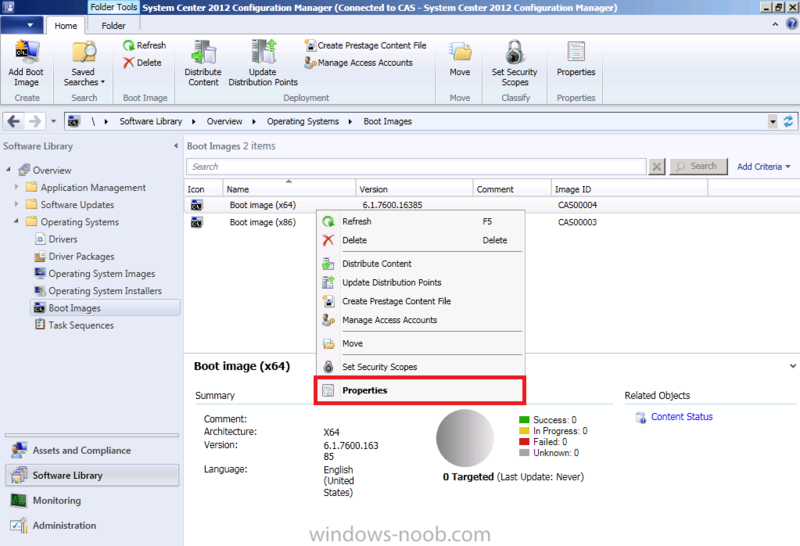 In order for our computers to boot over the network we must also enable PXE boot support on our boot images. Failure to do so will mean that windows deployment services (which answers the initial PXE requests from the client computers) will fail to find any boot images and PXE boot will fail. 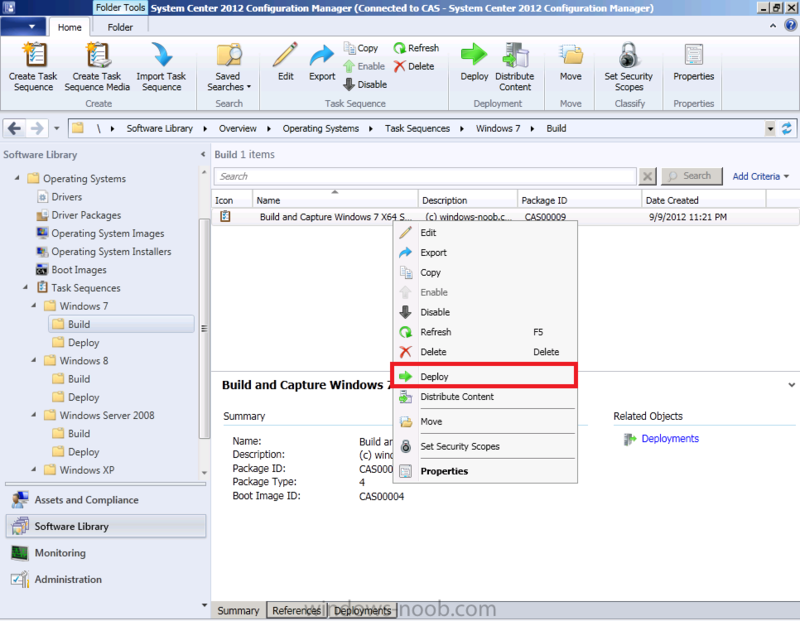 On the CAS browse to the Software Library workspace, expand Operating System Deployment and locate the boot images. Right click on the X64 boot image and select properties. 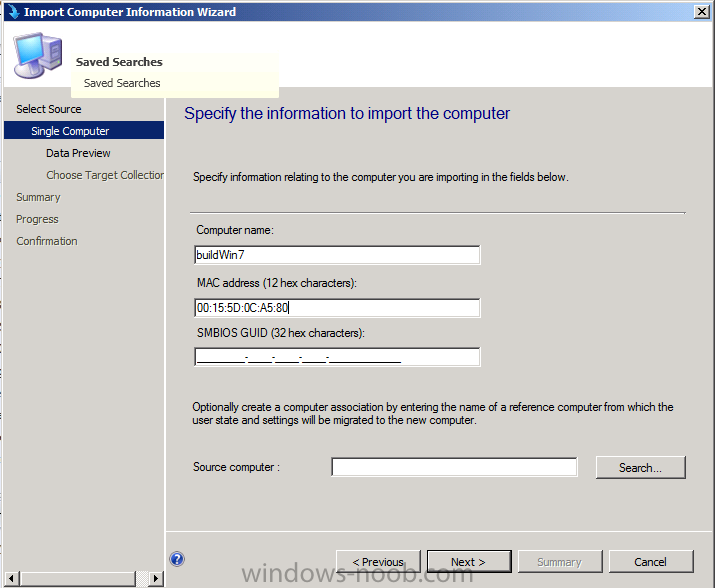 Select the Data Source tab and enable the following option Deploy this boot image from the PXE service point. 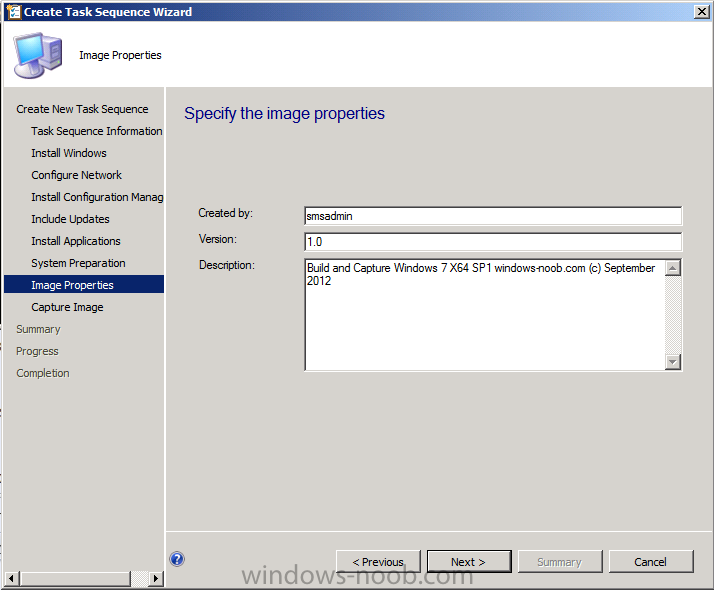 Click Apply when ready, and answer Yes to the distribute images prompt. 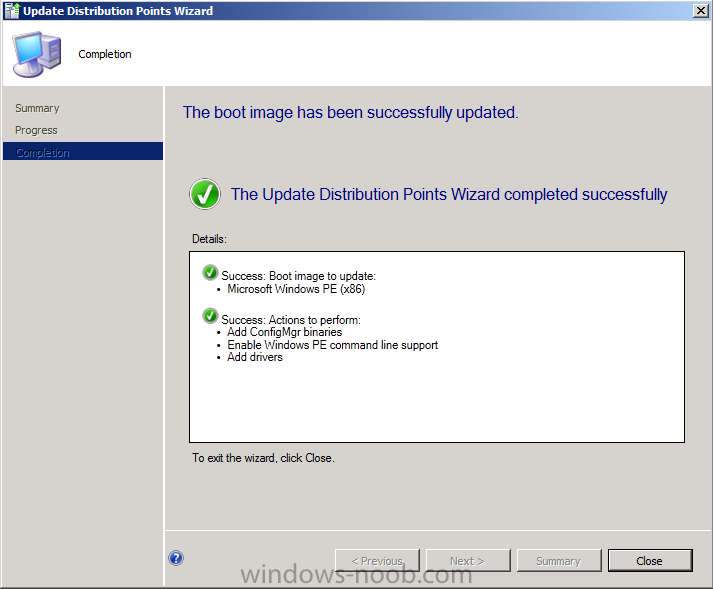 you will see an update distribution points wizard appear, click Next through the wizard until completion. 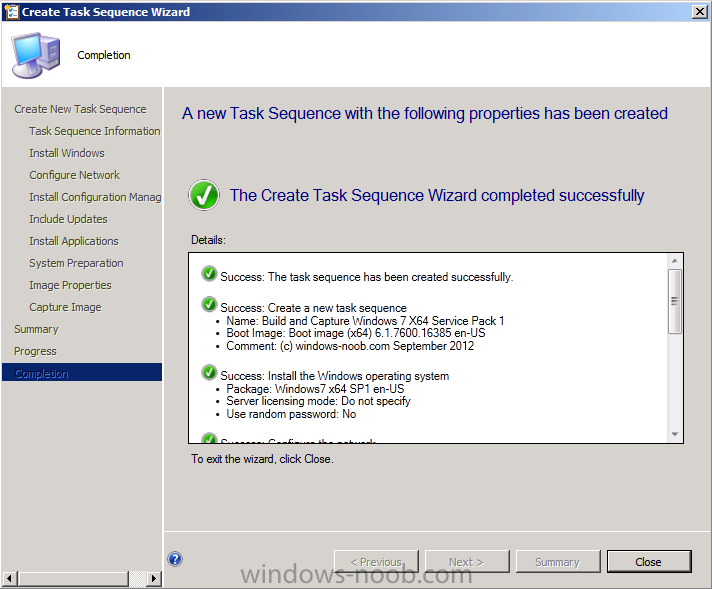 This takes some time to complete, therefore give yourself some time to complete this task. 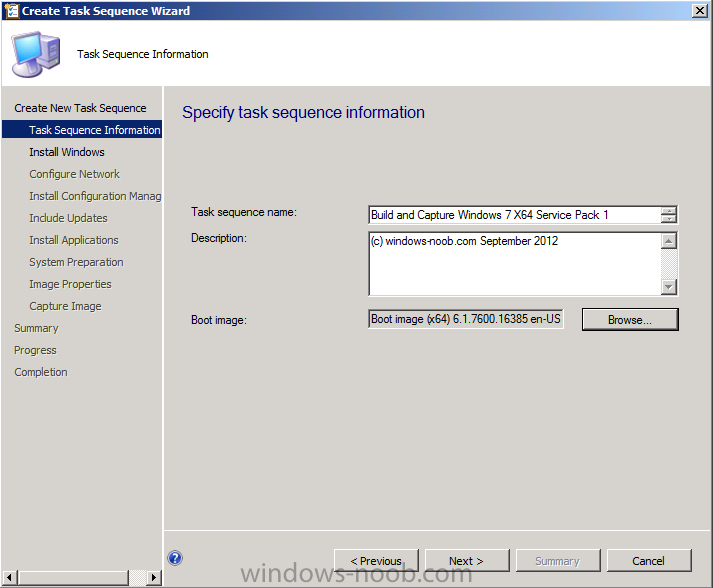 Note: Don't forget to repeat the above process for the both the 32 bit boot image and the 64 bit boot image. We need both Architecture boot images (x86 and x64) distributed to our distribution points with the PXE options enabled on them. 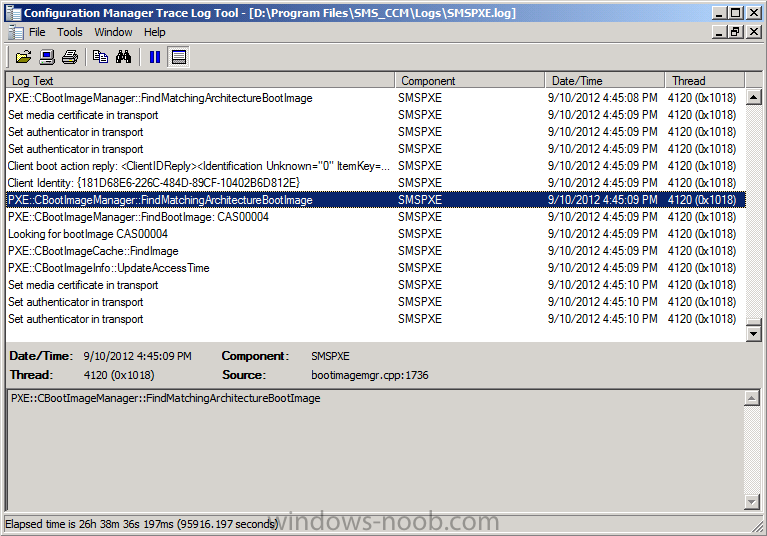 Tip: you can open the SMSProv.log file in CMTrace to review the progress of the boot image changes being made, infact in that log file you can even see that the CMtrace tool itself is now being copied into our boot images by default. Step 4. Enable the Network Access Account. 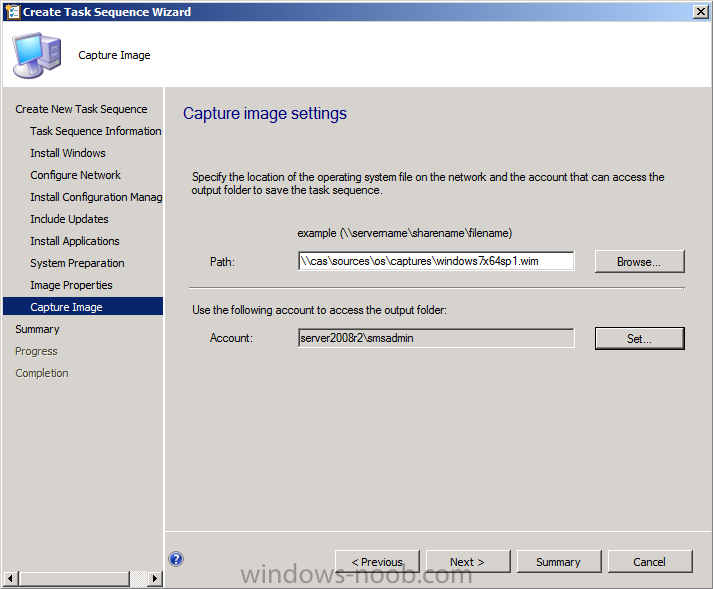 The Network access account is needed during operating system deployment in WinPE to access content on the network which is referenced by the task sequence. 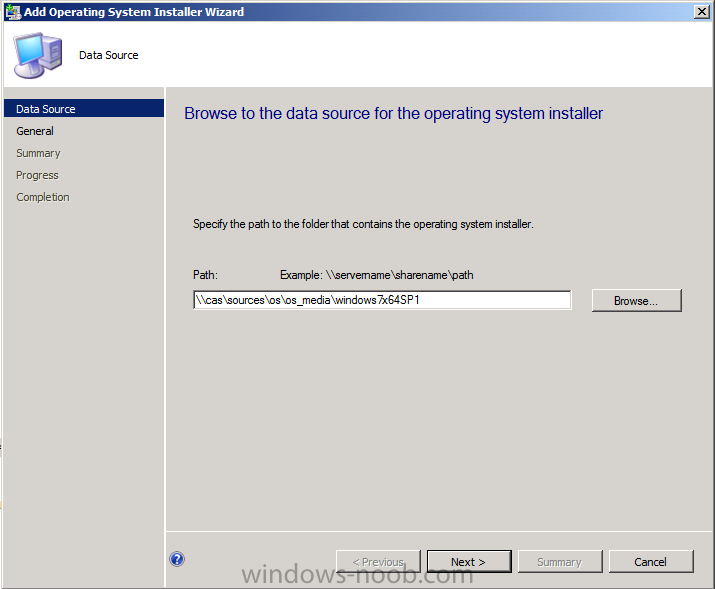 This account might also be used during operating system deployment when the computer installing the operating system does not yet have a computer account on the domain. 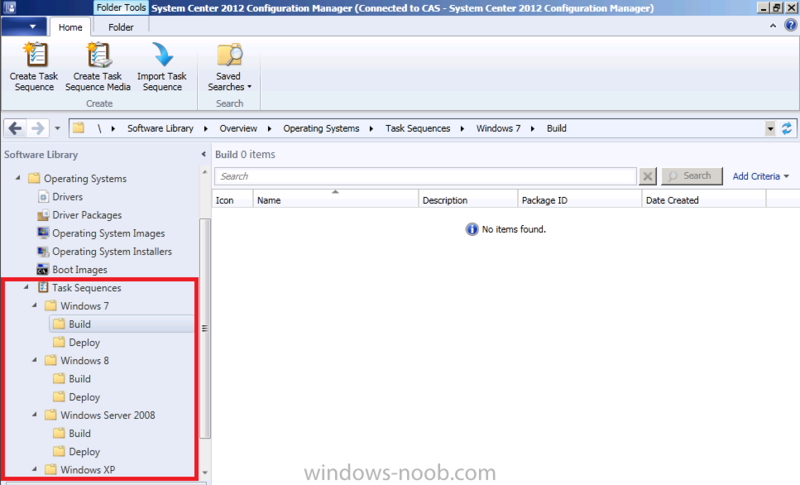 In System Center 2012 Configuration Manager RTM we use the Setup.exe method of deploying Windows which involves using the entire operating system image media (operating system installer). 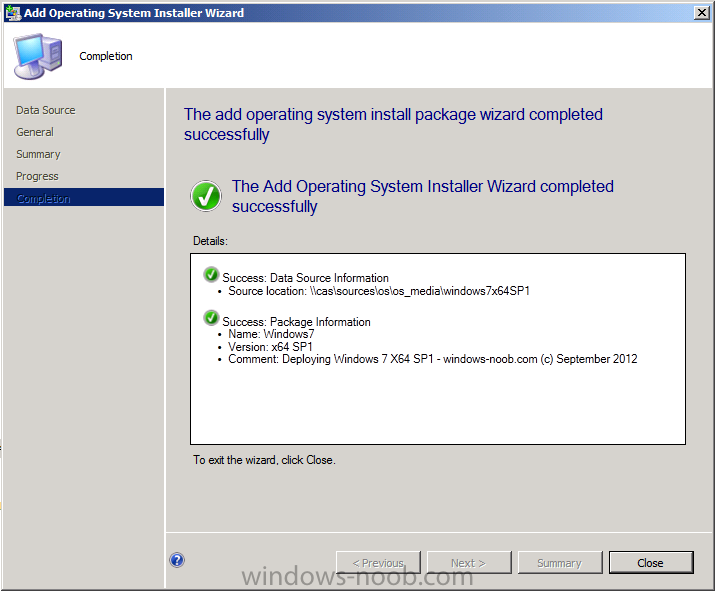 There are changes to this method in Service Pack 1, however this guide was written when RTM was the only version available, if you are using SP1 then read this post. 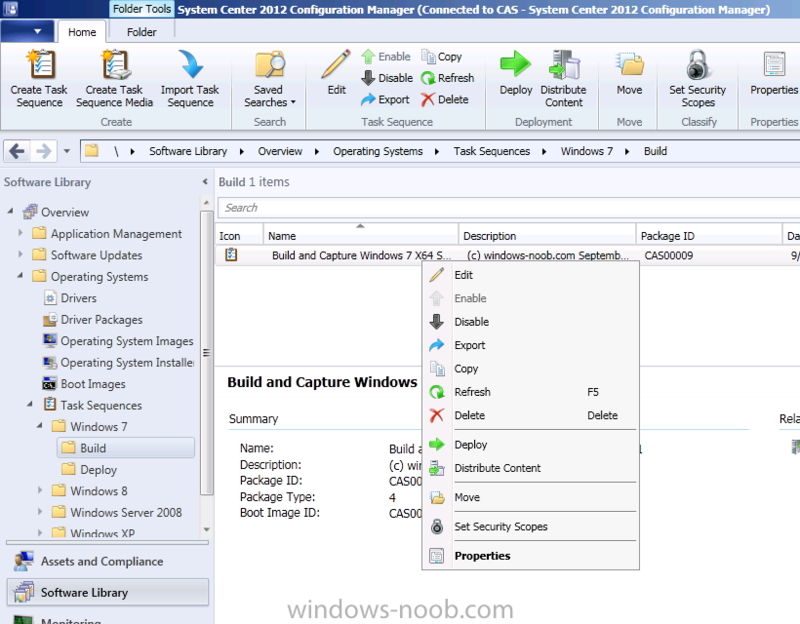 In this step we will use the Build and Capture process based on an operating system installer image (Setup.exe), this is applicable for Configuration Manager 2012 RTM. 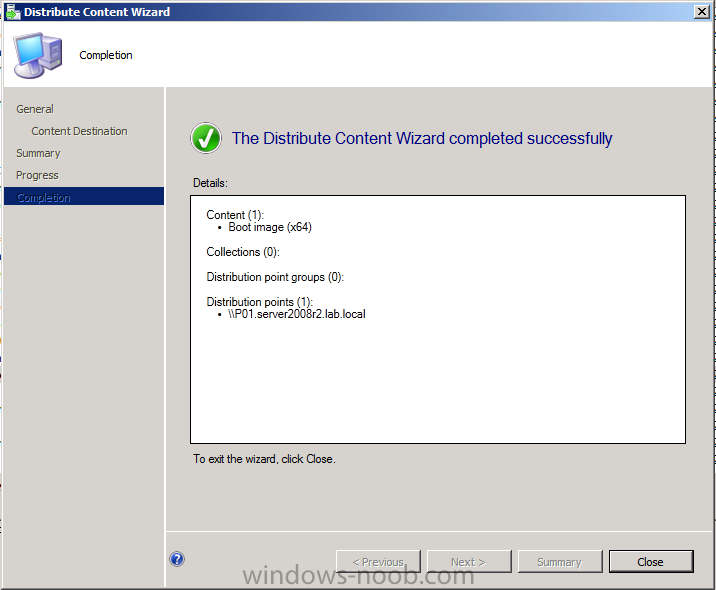 and click next through to completion of the wizard. 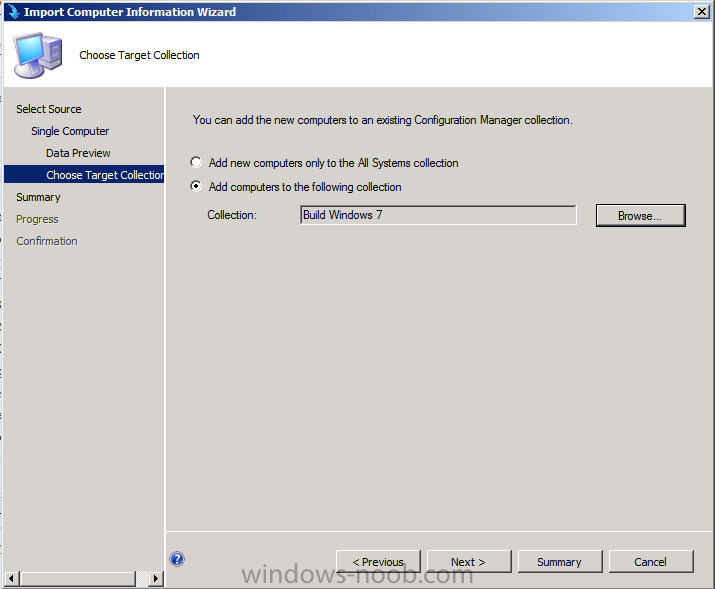 In order to simplify our operating system deployment process we will create some folders and collections in the following format, one Folder with two or more collections limited to All Systems within. 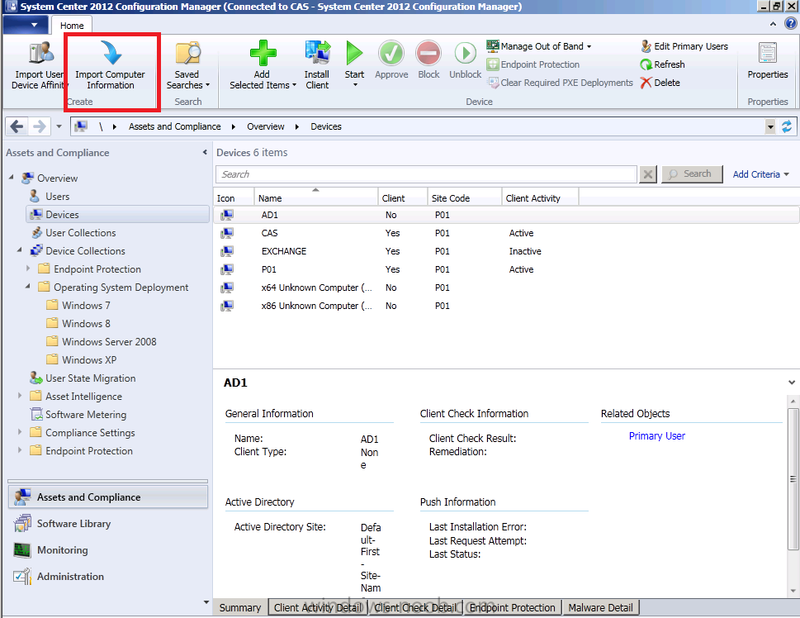 The collections do not need any membership queries and will be empty, below is a sample of what to create in Assets and Compliance workspace, Device Collections. 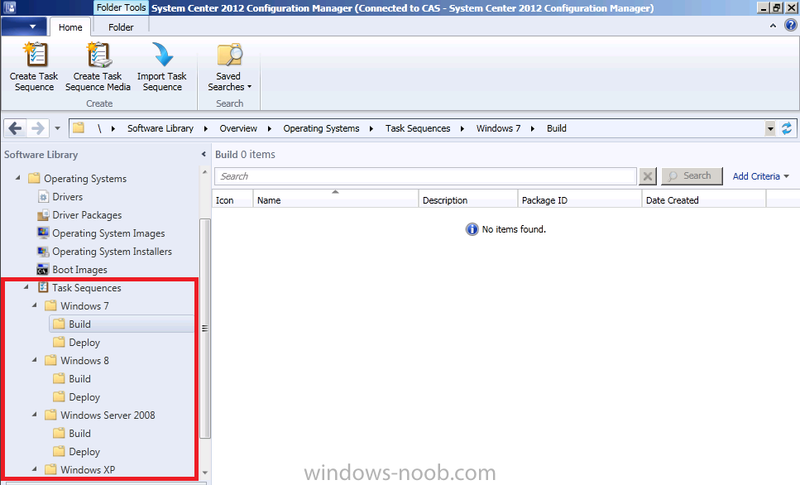 You can create them all manually in a couple of minutes or use a powershell script. 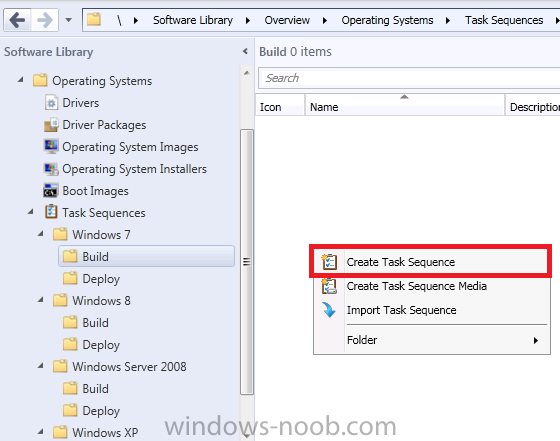 In Addition to the above, browse to Software Library, Operating System Deployment and select the Task Sequences node, create a similar set of Folder names to further categorize your task sequences, this is optional but recommended as it will make it easier to work with task sequences in the future. fill in some details about the image, make sure to select a 64 bit boot image when build and capturing a 64 bit image, it is fine to deploy a 64 bit boot image with a 32 bit boot image but for the capture process you need to select a 64 bit boot image. for the Install Configuration Manager step select the built in Configuration Manager client package, for installation properties fill in the FQDN of our primary site so that it knows where the Management Point is if you want to install applications or windows updates. 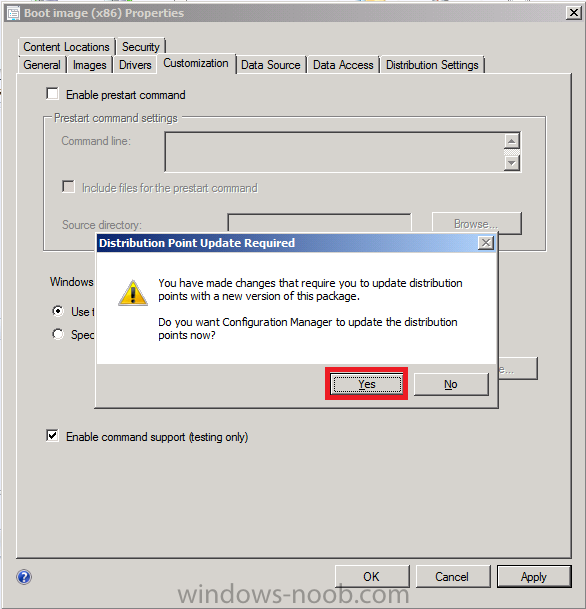 Tip: you could create a Configuration Manager Client Package from Defintion if you want to have control over the abilit to access this content directly from a distribution point. 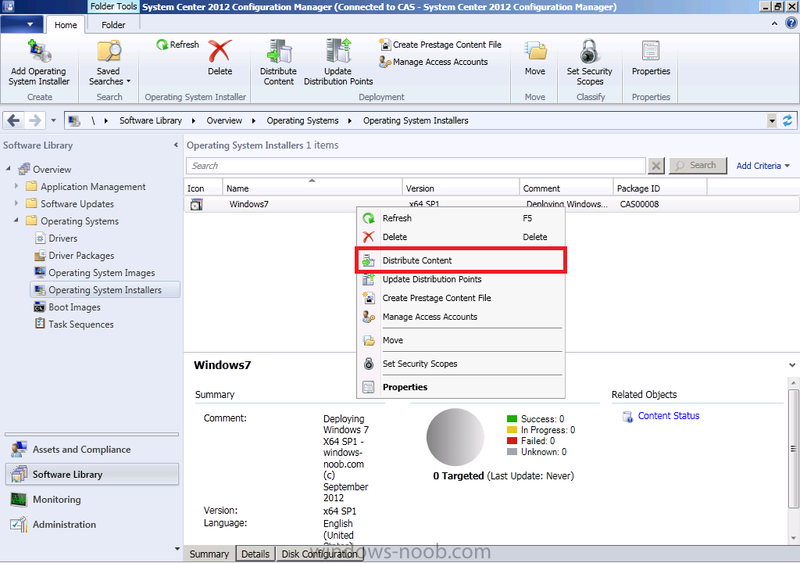 The built in package does not give you this flexibility as all options are greyed out. At this point you are ready to PXE boot your computer. continue the wizard through to completion. continue through the rest of the task sequence deployment wizard until completion. Next you need to import a computer into our Build Windows 7 collection so that it will have the Build Windows 7 task sequence made available to it. To do this click on devices in Assets and Compliance, and in the ribbon click on Import Computer Information. 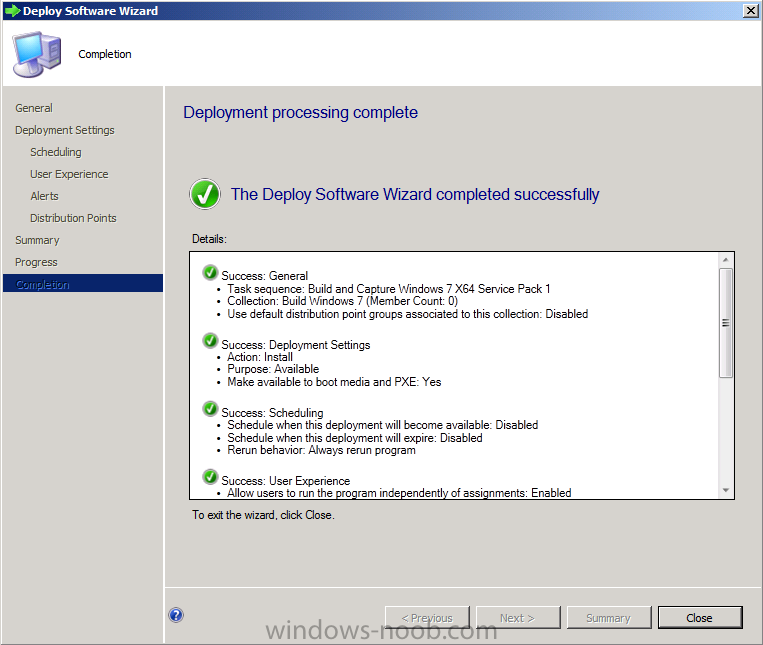 and then click through the rest of the wizard until completion. The above creates a Direct Membership query in the membership rules tab of the Build Windows 7 collection. Refresh the collection so that you can see the imported computer before continuing, if it doesnt appear ty to update membership then refresh. 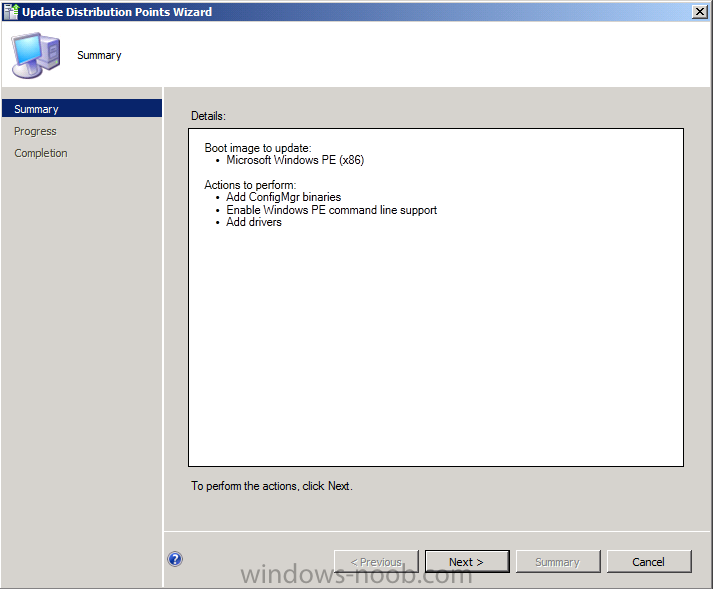 On your virtual machine, PXE boot and you should see the standard F12 menu for PXE boot. You did set the network card as the first boot device didn't you ? 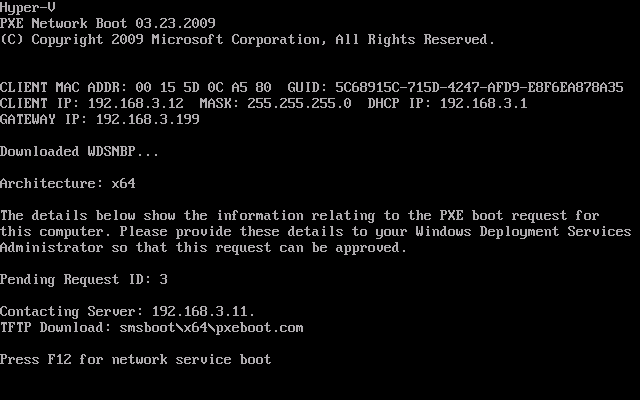 ;-) If you don't see any PXE messages then check bios boot order on your Virtual Machine (use Legacy Network cards in HyperV) and reveiw the SMSPXE.LOG. 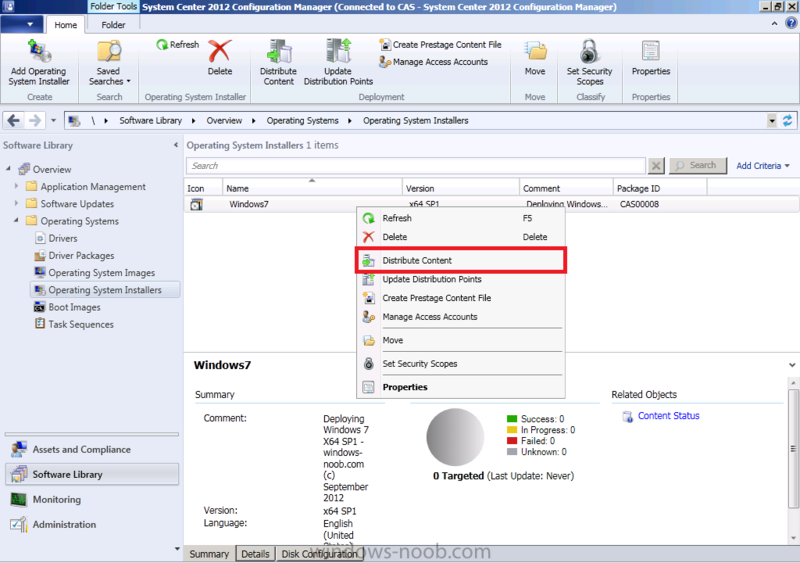 Tip: To troubleshoot PXE issues open the SMSPXE.log file located on D:\Program Files\SMS_CCM\SMSPXE.LOG on your Primary server P01 using CMTrace to get a live scrolling view of whats happening. 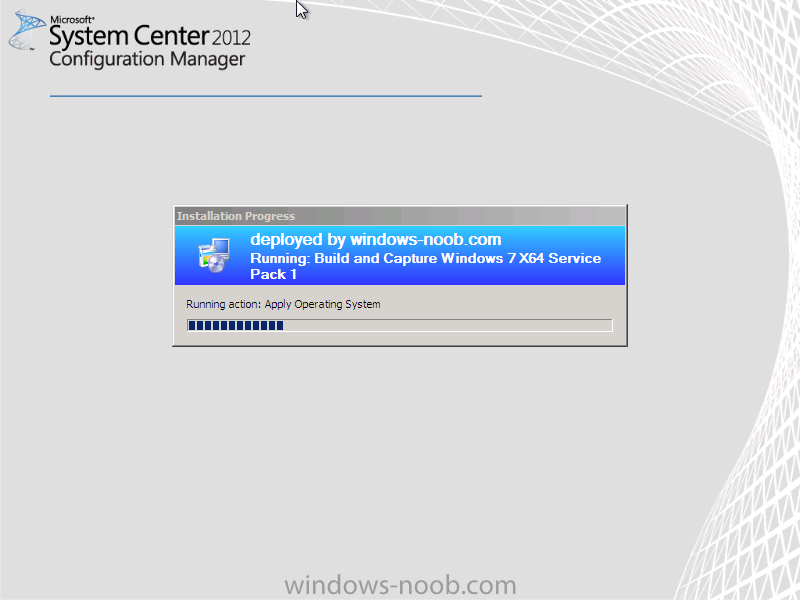 and off it goes, time for a well deserved break while Configuration Manager automatically does it's thing and captures your master Windows 7 image. 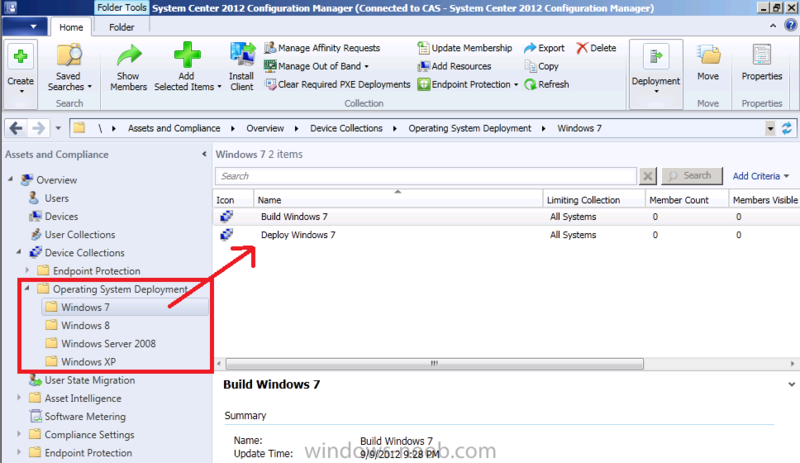 Tip: if you want your Organization name listed instead of IT Organization change it in Computer Agent section of the Default Client Device Settings. 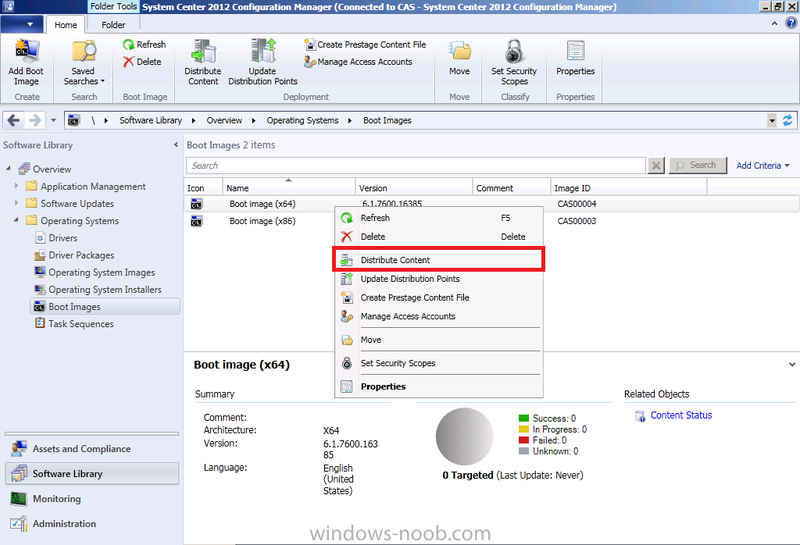 in a later part of this series we will deploy the captured image using a separate task sequence, and customize it to work with different hardware, add some applications and windows updates. Thank you again. I have completed everything and not getting PXE boot screen. I have changed boot order to boot from NET. 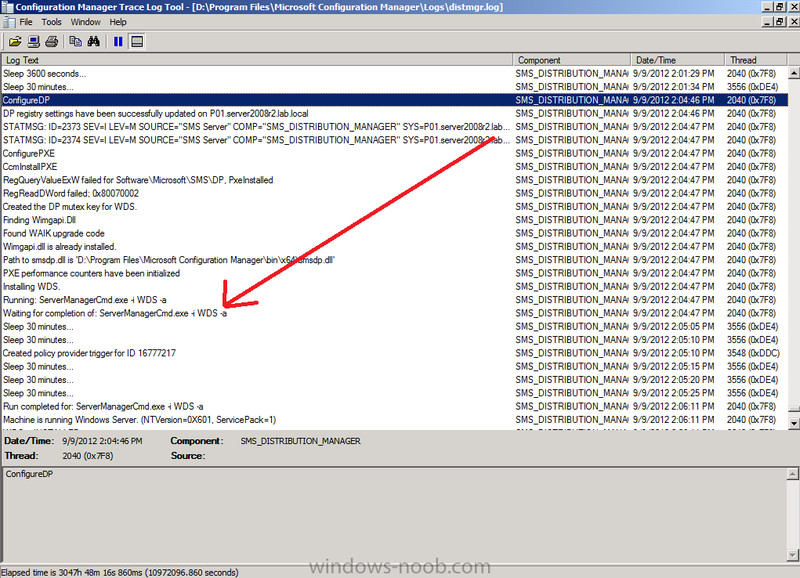 I dont see anything in the log file. What am i missing? I have been able to start the TS from the boot.iso i created. 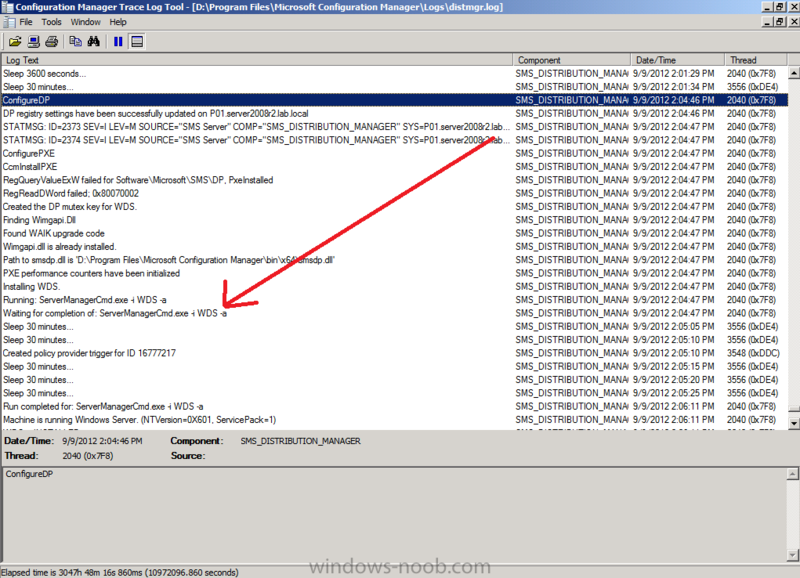 Not sure what steps i can take to look into the pxe problem. Fixed. If anyone else is having same issue. 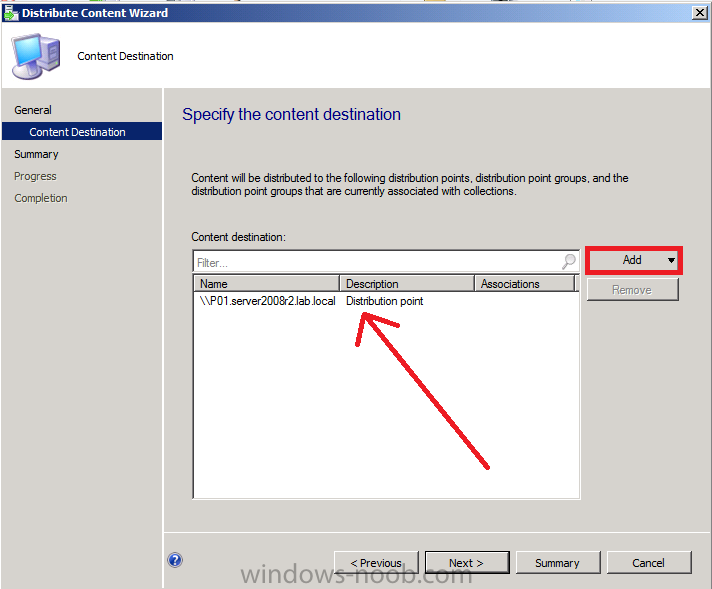 Make sure you use "Legacy Network adapter"
which I pointed out in Step 11. Thank you very for the site. I'm sure this is something very simple and obvious, but I've come to step 11, PXE boot our computer and I don't know how to start this virtual machine up. I thought I would have a 'remote control' option, but that's grey'd out. 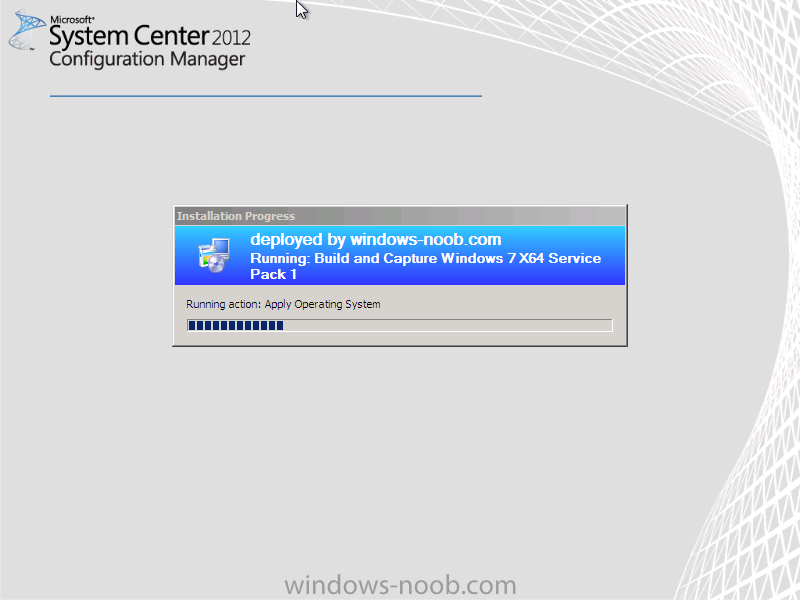 First time digging into sccm and I've followed the previous 6 parts up to this point. I'm unclear what that means. I'm simply trying to understand how I can start the 'buildWin7' machine up so i can PXE boot it. Any instructions for that? 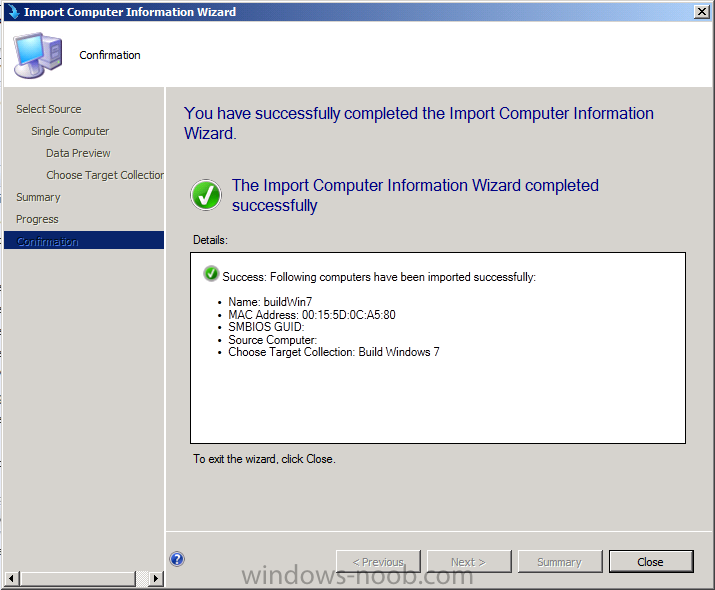 When I import computer in collection, I have to way very very long time before that computer appears in collection. Update membership and refresh don't change. Could you advice why or how force? 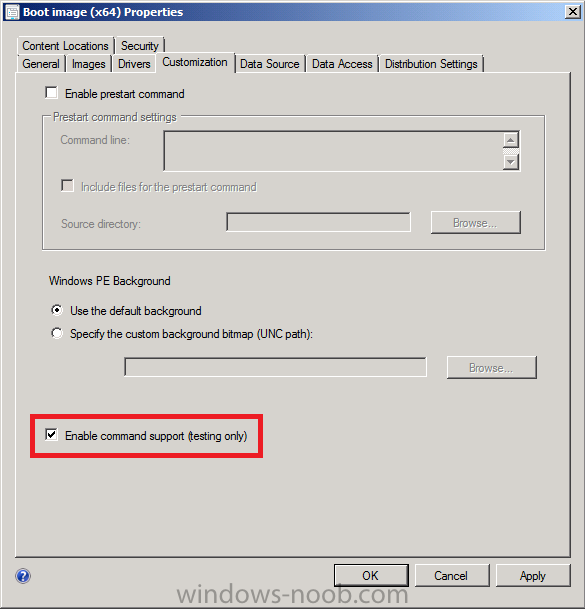 You have to enable "remote controll" in the default client settings! I created a virtual machine on the same host I have the servers on and can not get it to PXE boot as it's not getting an IP through DHCP. I have my dhcp server as ad1 (see screen shot). I'm running the lab domain in my corporate environment and have a vlan configured so nothing get's disturbed on the production environment. Anyone find a work around for this so it gets an IP? Sure did. I'll try doing this off my vlan. I think there's some complication using this. 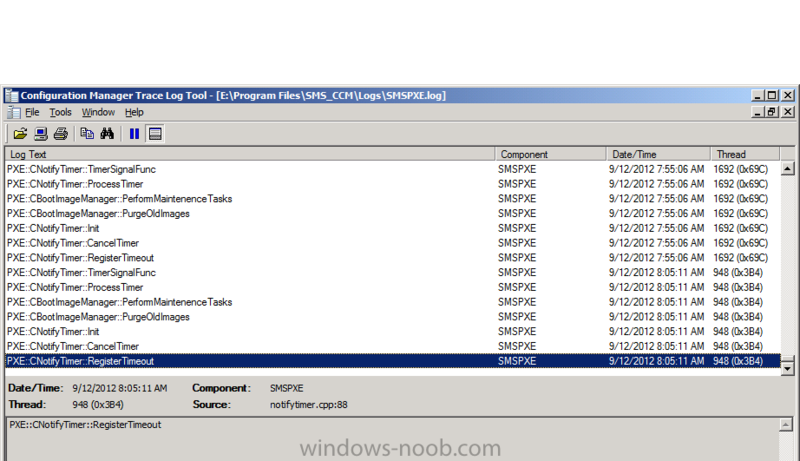 Have you checked the smspxe log on the server? , did you check that wds is up and running? 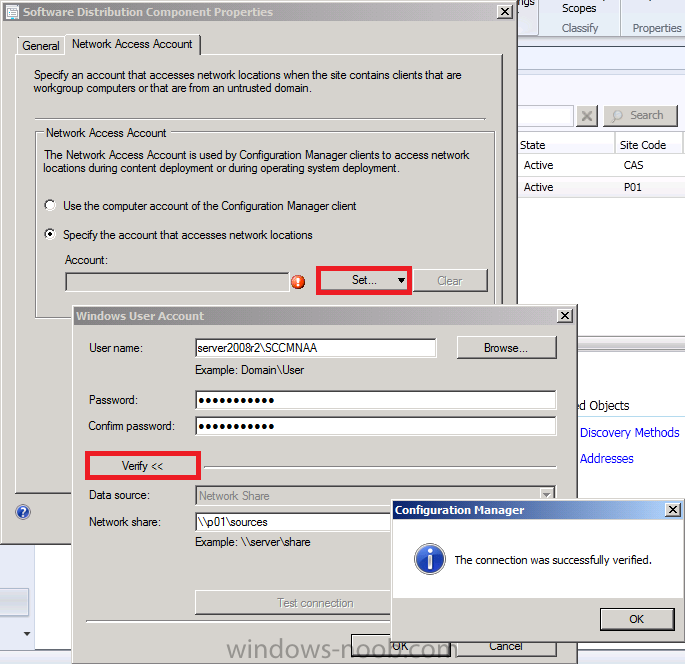 And like anyweb said, you need to use the "Legacy Network Adapter" for network boot. 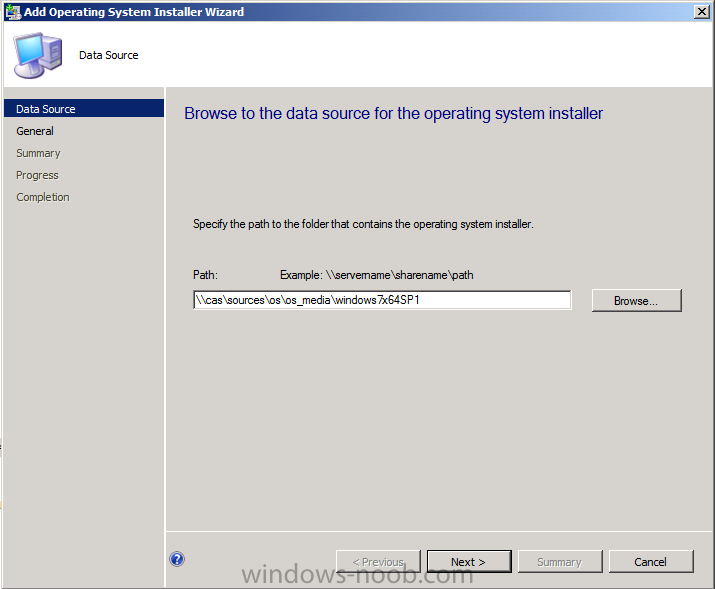 You could try installing windows manually just to se that you can get an IP adress in there, if that works you probably need to configure IP-Helpers if the computers are on seperate networks. 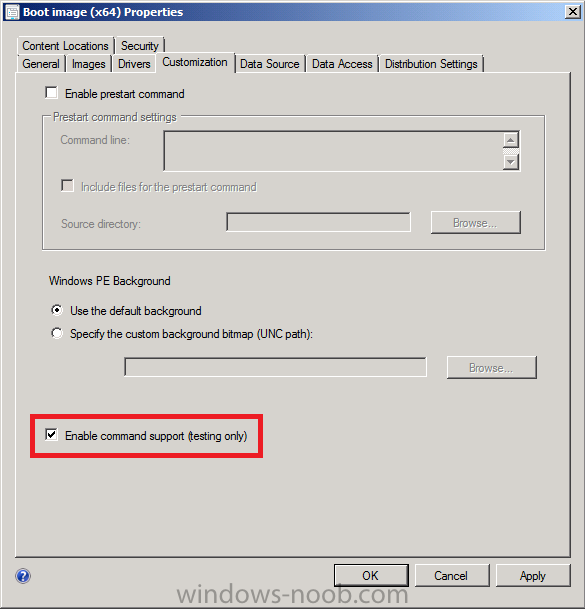 here's a guide explaining how to setup a Virtual Machine (Step 3. 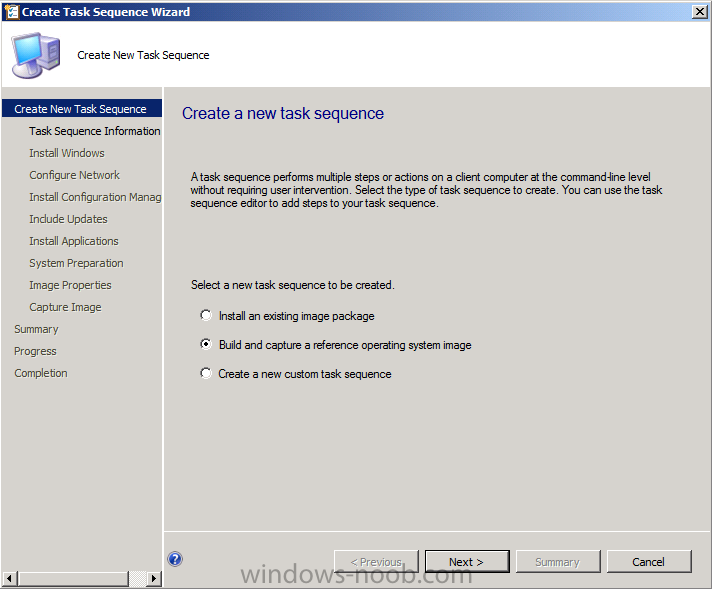 Create New hyperV virtual Machine) which you can use in the guide above. 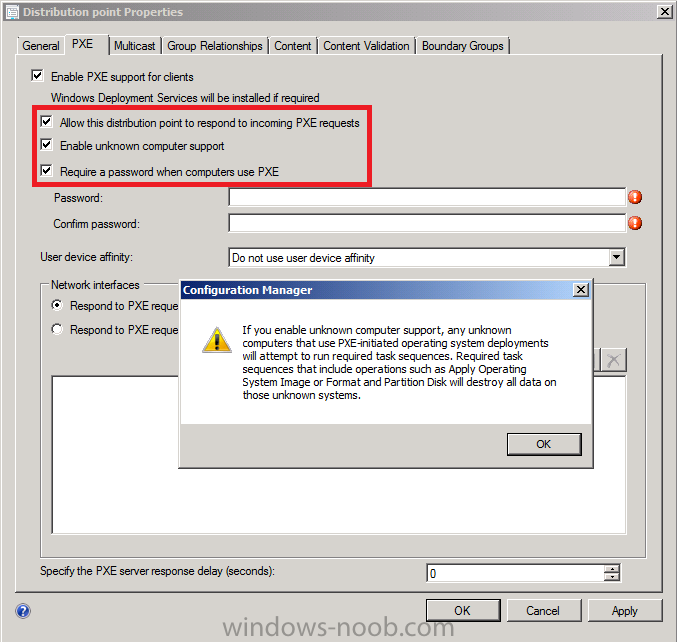 that said, are you PXE booting a computer that is in the same VLAN (network) as the network that your Configuration Manager PXE enabled distribution point ? I´m trying to deploy Win7 to a desktop, I followed all the steps but when i try to start the computer i get this message. What happen if my computer is in a different VLAN? What can i do? Yes I am booting my noteboot in the same network area and it the network as my Configuration Manager PXE enabled distribution point. 1) in the bios I put the boot option on "Network LAN"
With MAC ADDR 8C:73:6E:08:76:57 GUID ####################. 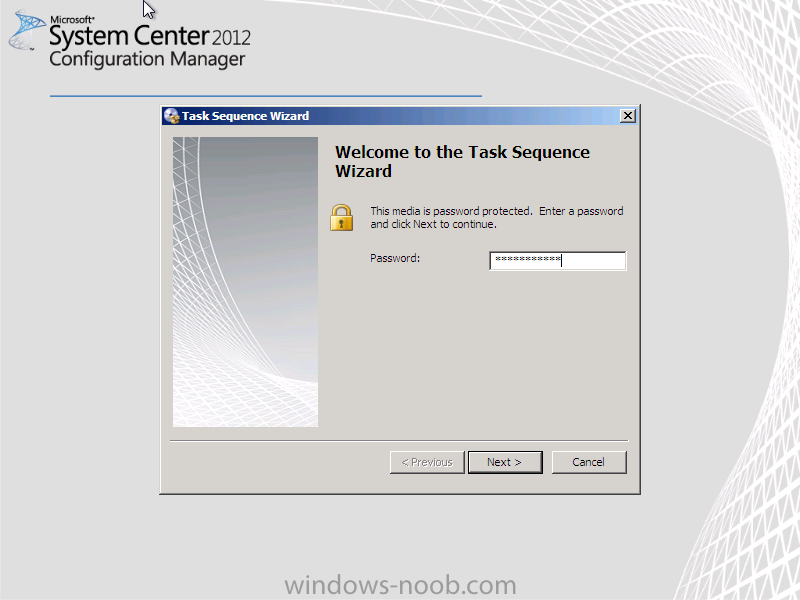 But I see while the booting notebook a other GUID number as in sccm2012. I am goging to "Asset and Compliance"-->Devices-->choose my notebook---properties--General, here I see a different GUID number. Is it the the problem? 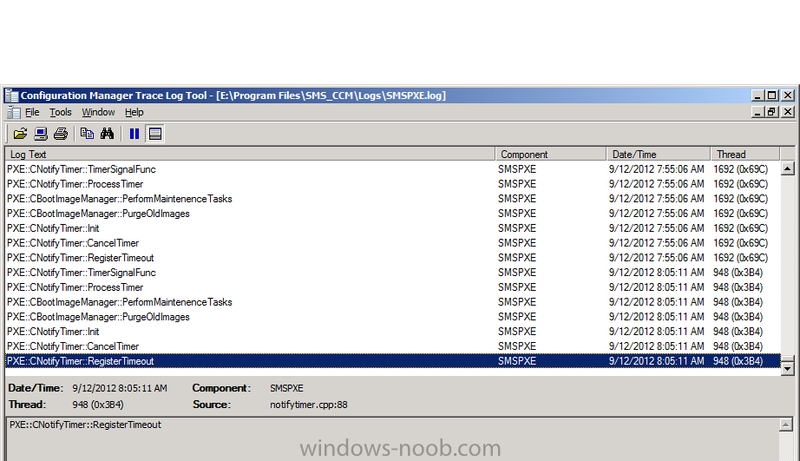 there are SP1 guides already if you look here (look at the Windows 8 posts, UEFI, pre-provision BitLocker and more), but for this series of guides I will stick with the RTM release until SP1 is released to manufacturing. did you enable PXE ability on both boot images, did you enable it on the DP, did you enable it on the task sequence deployment ?